I was doing my morning study today on fruit and was blessed with some clarity by a verse in Romans – the second part of this verse just popped off of the page! The fruit word study will have to wait!!! The second part of this verse . . . It needs to be emphasized!! 4 . . . you don’t realize that God’s kindness is intended to lead you to turn from your sins. ie – Repent – turn towards God away from your sins – we are either turning away, towards sin away from God or turning towards God and away from sin – there are only “2 roads” – one is easy and wide – one is narrow and hard. There are many that call themselves believers that choose the easy and wide road. I was one of those at one time. It was EASY. It is so easy that even the demons believe – it won’t save them. According to Yeshua, if we choose this path it wont save us either – the text tells us what He will say – I never knew you. Yeshua is God’s kindness – a kindness intended to lead us to turn to God from our sins (repent) because Yeshua means, and is, Salvation! We have to look at some context. In the text of Ya’akov (James), we are given an explanation about the difference between a hearer and a doer. that can save your lives. 22 Don’t deceive yourselves by only hearing what the Word says, but do it! As you can see, Nike wasn’t the one that came up with this slogan! Ya’akov (James) is saying don’t lie to yourself and think you can be a believer and at the same time be morally unclean (vulgar) and living a life in opposition to God’s word (depraved – obvious evil), He is saying to be a “DOER” of God’s word. and to keep oneself from being contaminated by the world. How many congregations are full of religious people that call themselves believers but follow neither of these things? How many churches send money to missions while neglecting the poor in their own midst on a weekly basis? How many pastors talk about their favorite secular movies, bands, and sports teams from the pulpit each Sunday? How many people brag about how their child knows when to look away or mute the television when objectionable material comes on? Doesn’t it really beg the question, why are they being allowed to watch it in the first place if they have to mute or turn their eyes and ears away? When I was younger, I used to love those kind of preachers! The pastor KNEW what was important – he was seeker sensitive! He knew some of us had 3 or 4 fantasy teams to monitor! The sad part is, this is how “hearers” are built. A VERY important thing to remember before you discard what I have just stated is that turning to God from our sins is PURSUING HOLINESS! All of the excuses in the world won’t omit this! It is a litmus test. Is what I am doing pursuing holiness or the opposite – Godlessness? When I ignore the widow or orphan in my congregation, am I pursuing holiness or Godlessness? When we build a seeker sensitive church that drums down the message of repentance so that unbelievers will feel more comfortable, is pursuing holiness being promoted or is Godlessness being promoted? And yet, few people seem to want to take what Yeshua says seriously! Like I said, it couldn’t be any clearer! Some will argue with our Lord, (as if that will matter or have any bearing), that they did great things in His name – even miracles! “What good does it do, if that “SOMEONE” isn’t you?!? And did these people, that will argue with our Lord citing all of the things they did in His name, keep themselves from being contaminated by the world – or did they embrace it? It is time to take inventory. To look at ourselves critically in light of God’s word. Are we “hearers” or are we “doers?” There needs to be some urgency here! Our Lord is coming soon! Be “doers” and be blessed! This entry was posted in Living life Even if . . ., Salvation and tagged Adonai, akroatai, christianity, church, congregation, Discipleship, do it, doer, even if, God, hearer, james, Jesus, kindness, nike, orphans, poiētai, repent, salvation, save, turn from your sins, widows, word, worldly, Ya'akov, Yeshua. Bookmark the permalink. 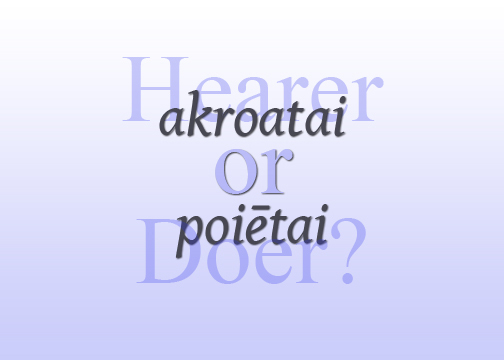 4 Responses to akroatai or poiētai? Thanks for stopping by and reading Waurane – be blessed!